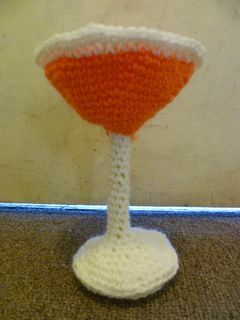 This is a crochet cocktail I designed in honour of my sister-in-law, who introduced me to the colourful and delicious world of fancy drinks. This particular cocktail has the advantage of being much cheaper than most cocktails, although I can’t claim that it tastes very good. This pattern uses 8ply wool and a 4mm hook and is written in American crochet notation. The finished cocktail is 16 cm tall. Slip stitch. Fasten off, leaving a long tail for sewing. 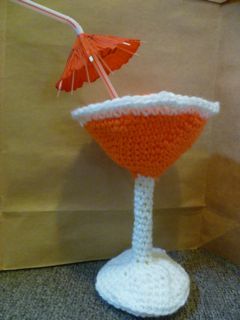 Pop two pipe-cleaners into the stem, stuff the bowl and sew the top of the drink onto the bowl where the orange meets the white.